Hello and thanks for stopping by! 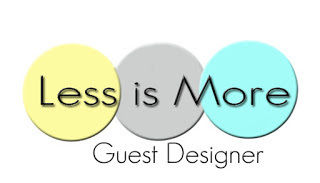 I am so excited to be Guest Designing over at the Less is More challenge blog today. This is one of my favourite challenge blogs so I was honoured to be chosen as the October winner and invited to guest design for this weeks challenge. The theme is birds/feathers so I have used the beautiful stamp from Papertrey Ink Feather Finery on my card. I inked up the feather with Kaleidacolor - caribbean sea ink, gave it a light spritz with water and stamped onto some water color card stock. I used the matching die to cut the feather out and mounted it onto my top folding card base. Thanks for looking and you can click here to check out the challenge for yourself. Wonderful CAS card, Michelle. Congrats on your GD gig. Love the pretty colours with the watercolour effect. Such a stylish, elegant and beautiful card! I love the blend of colors in your feather and what a beautiful sentiment. Thanks for being an awesome GD at Less Is More! What a gorgeous card Michelle ! Love the colours you chose and the beautiful technique ! I have to try it one day ! As always a wonderful CAS card ! So delighted to have you as our Guest Designer this week ! Beautiful card...thank you for being our guest!